Wow, five years already! Happy anniversary to Altenew! I have watched this company grow so much in the past five years and always amazed at what new products them come up with month after month. But today is about a celebration of a milestone, and I have picked out one of my favorite sets, the Wildflower Garden, to play with and create! I think many of you would agree with you me hands down that Altenew have an incredible line of floral products and their inks are outstanding. I use them all the time! I absolutely adore the Wildflower Garden stamp set, and stamped them in various colors using Altenew dye inks (specific inks listed below). With one layer stamps, I like to use my mini dauber to add ombre shades of ink onto the image to create my definition. I did so in the flowers and then die cut them out with the coordinating dies. The leaves and some background floral were stamped right onto an A2 sized white card stock panel. I used the same inks to add some ink blended colors to the bottom and top edges of the card, and added splatter for interest. 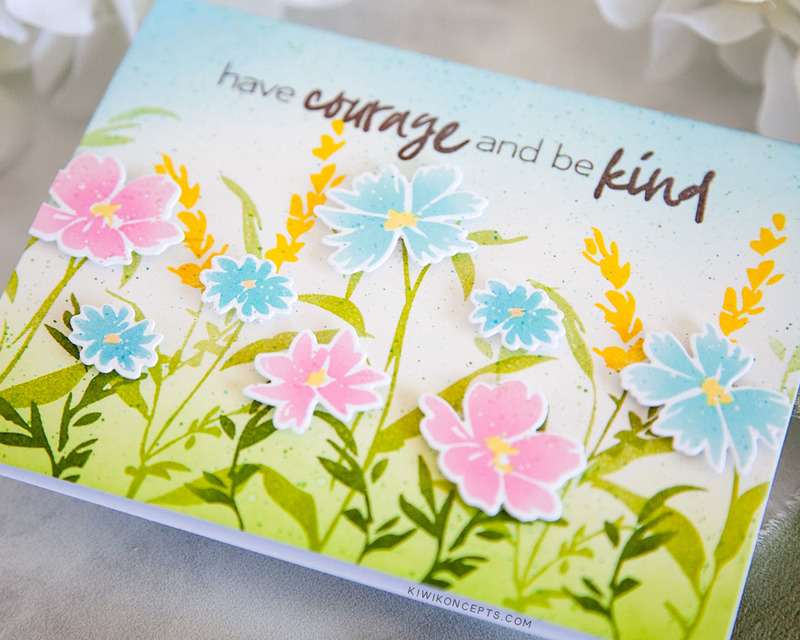 I selected this lovely sentiment ‘have courage and be kind’ from the Better Together stamp set. I stamped it ink a dark brown hybrid ink right in the top center, above my wildflower field. And finally, I added all my flower die cuts onto the card with foam tape. Don’t you love the Spring-y look? This post is part of the Altenew 5th Anniversary Blog Hop Day 1! If you’ve been hopping along with us, you would have arrived here from Vicky’s blog and your next stop is with Zsoka! You can find the full blog hop list or start at the beginning from the Altenew Card Blog. To celebrate this release, Altenew is giving away a $50 gift certificate to 5 lucky winners and one Altenew Academy class to 10 lucky winners! There are also 14 awesome companies and crafty friends who are celebrating with us and they are offering przies as well! Check out the full list on the Altenew Card Blog post. Be sure to leave comments on any or all of the blogs in this hop by 4/12/2019 to win. The more blogs you comment on, there higher your chances! A total of 33 winners will be chosen at random and winners will be announced on the Altenew Blog on 4/20/2019. During this time, enjoy FREE U.S. Shipping when you shop at Altenew with the code HAPPY9M or $5 off international shipping with the code SHOPPING9M at checkout. Offer valid from 4/2/2019 at 12:01 am EDT through 4/5/2019 at 11:59 pm EDT. Not valid on prior purchases. Maximize your shopping savings by checking out the Sale section for products discounted up to 40% off or the Clearance section for products discounted up to 60% off! Beautiful card! 🙂 Love the pastel colors. Keeway, this card is just gorgeous, as are ALL of your beautiful designs I’ve seen on the Altenew blog over the years! Thank you so much for giving me so much amazing inspiration every day! Oh my goodness, this is so beautiful and sweet! I love your work and I love Altenew – Happy 5th Birthday!!! I love your card! Reminds me of a meadow of wildflowers! Thank you for a new way to use this beautiful altenew wildflower stamp set! Wildflower Garden is one of my favorite Altenew Stamp sets too! I love the dimension you added by popping up the blooms. This card is just beautiful, thanks for the inspiration. Happy Birthday Altenew! Just love that wildflower Stamps at such a beautiful card love the pastel colors !! I’m so in love with Altenew!! Can’t earn money fast enough to buy all the ones I want but I do have quite a few … about 70 sets to be exact! So happy to be able to purchase them here in Germany!! Congratulations Altenew! And thank you Keeway for all your ideas and know-how!! Such a pretty springy card! A beautiful card, perfect for spring! Beautiful card. I like to make this kind of card, so I’m happy you shared yours. This makes me read for spring! I do like your Spring looking card and how you pop-up the flowers. Such a bright happy card. Thanks for sharing. This is such a beautiful card! Love the pastels and dimension! Your card is so pretty with the soft pastel colors. I love how you die cut some to stand out. The sentiment is great with the two fonts. Thank you! Gorgeous card! I love the colors and the sentiment is great! I am inspired by the speckles! Beautiful! I needed a little reminder that Spring really is on the way. We had some snow this morning! So Pretty! This is a must have stamp set! Beautiful cards! Happy birthday Altenew! I love this card! Happy Anniversary to Altenew! This card is so pretty! Tfs! Very bright and happy. Love Altenew. What a sweet card! Congratulations!!! This card is very sweet just like all your wonderful cards, Keeway. The pastel colors are lovely. Happy anniversary to Altenew! 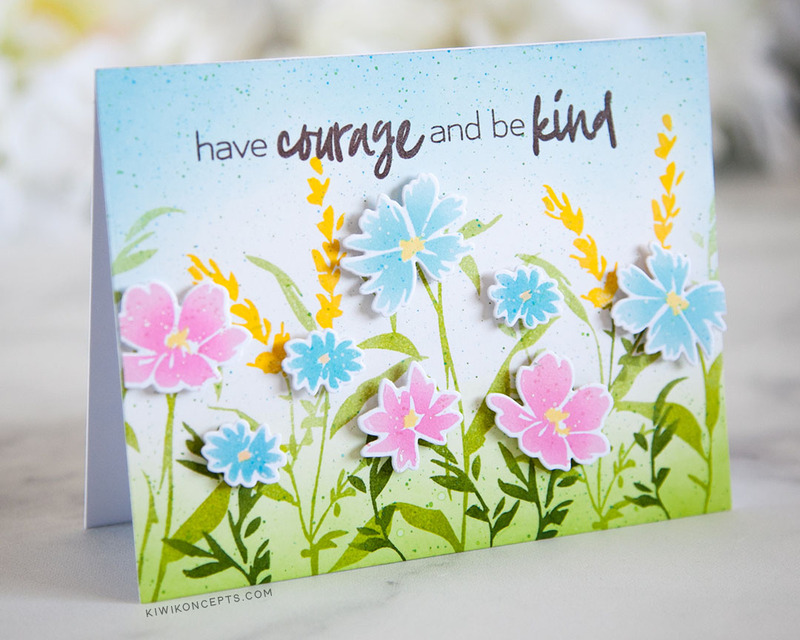 Love the soft colors on this pretty card Keeway! Thanks for the inspiration! I love your card and such great words of wisdom to follow! Your card is so pretty! Happy Birthday to Altenew!! I love your beautiful, colorful flower garden. Happy Birthday, Altenew! The wild flowers are so pretty on your delightful card. Happy Anniversary Altenew. Great tip for one layer stamps. Beautiful card as always. So pretty ! Happy Anniversary Altenew , Very pleased to be a part of your success 5 years ago 🌷 , much more success to come . Beautiful card! I love the saying! Happy Anniversary to Altenew! They make such amazing products! I really like the colors you chose for this card, just lovely. Happy 5th anniversary, Altenew! The Wildflower Garden has been on my wishlist for quite a while. Your card makes me remember why I wanted it. Lovely card – and a fabulous sentiment. Happy Anniversary Altenew! This is such a sweet card! Happy 5th Birthday! What a pretty spring card! I have to use your hint of dabbing a few colors on the solid petals to get a nicer, ombre effect…thanks. Such a sweet encouragement card! Very fresh like spring time! Pretty card! Happy 5th anniversary Altenew! I love love your card! Spring-y indeed. I want this stamp & die set now too! So delicate and Spring Timey. Beautiful work. I love the springy colors and the sentiment. The World can definitely use more kindness. All round beautiful card! Beautiful card. Happy Anniversary Altenew! Love your products. What a lovely, lovely card! Thank you for sharing and thanks to Altenew for bringing us so many wonderful products over the past 5 years. Happy 5th, Altenew! Such a beautiful card looks like Spring for sure. Happy Birthday to Altenew! Such a pretty card Keeway. Those popped up flowers look beautiful! Great colors. Happy Anniversary Altanew! I love your card. It is so sweet and beautiful! Thanks for the inspiration and to Altenew for 5 years worth of great products! Gorgeous card, the flowers over the lightly inked background are very festive and pretty. Beautiful card and I love the spring colors as well as the dimension you created by popping up the flowers. Great job! Gorgeous card sample! This set is very top of my list for my next purchase! Love seeing what you did with it! HB Altenew! Such beautiful work! I love Altenew and you are one of my favorite artists! My ‘wish list” is huge and forever growing. Happy five to Altenew on a job so well done! What a beautiful card using the wildflower garden stamp. The colors are so fresh and springy! I love this simple scenery you created with the flowers! Such a pretty, spring card! Love the soft colors. Very pretty cards. I love the soft colors. Such a pretty card and a great reminder on a grey day that the spring flowers will be here shortly. Love your card and the beautiful spring colors!! A very fun “Spring” card. Really like the sentiment also. Thank you for sharing! Love your card. Especially that you popped up the flowers over the leaves. Looks beautiful. If I had to pick my favorite stamp set of the year (of the year this one came out), it would be this set. I love using it!!! So, so pretty. I absolutely love this card. it reminds me of spring. It is so cheerful. Beautiful job in your designs. Love your style and your techniques are amazing. I can’t wait for your next post. Love this beautiful spring card and its sentiment…words to live by! Thanks for brightening my day. Beautiful Card and a great sentiment too! Nice way to showcase for Altenew! Your beautiful cars is like a little garden! So adorable! I’m a big fan of anything floral. You do such great work coloring these Altenew stamps and bringing them to life. Thanks for the inspiration! Very happy anniversary to Altenew! Your wildflower card is what makes me want to grab this set! Your soft palette colors makes this card spectacular! I love it. Happy Birthday Altenew and yes they do make fabulous flower stamps and dies! So beautiful! You really can’t go wrong with Altenew products! Absolutely love the soft colors on this beauty!! So much color and happiness! Makes me feel like I am in your garden! Great job! Oh my gosh! This card is so so pretty!! Love how the flowers pop up! Such a small detail that really makes the card grand! Sweet garden scene and love the colors! I like the combination of the stamping with the die cuts. It gives a bit of dimension. Very pretty. Super pretty card with a great sentiment. Happy 5th Altenew! Love your card! I feel like I am in a field of wildflowers. I love your card! Now you are making me think I need that stamp and die set. Beautiful card. I love the soft colors and the sentiment is wonderful. Your card is so beautiful.. love it!! Such a beautiful card – with such great Altenew products! Love your background gradation and use of varying hues of green to create depth in your floral stems. Love how soft and sweet this is! I like the soft colors in your card. I have been wanting to purchase some altenew inks and play with them. Your card reminds me of a breath of fresh air! Lovely. Loving your card. It’s so dainty and springy. Beautiful job! Thanks for sharing your creativity! Love your choice of colors and stamp arrangement. Quite an inspiration. Your card makes me think of spring, gorgeous flowers! Love the colors you chose for your card – they are soft, yet pop with happy sunshine. Thank you for sharing your creativity, your card is sweet & gorgeous! Beautiful card, so springtime and happy! I love this card and would love to receive one like this. Love your card. Says “Spring”. Love the pastel colors. Love the pink and blue with a pop of yellow! Love the freshness of your card. Makes feel spring. Thank you for the inspiration. Happy 5th Annivarsary Altenew! The wildflower garden flowers are refreshing! Love the informal styling! Beautiful card! Dainty and beautiful card. What a lovely sentiment too. You do such a nice job! Such a great Spring time card! Such a beautiful spring card. Stunning card. Love the spring colours. Love the beautiful garden you created on your card! Fantastic card! I have this set and it is alot of fun. Great job!!! Pretty spring feel card! Thanks for the inspiration. Thanks for the tip on using a mini dauber to add ink in an ombre to a single layer floral image. I never would have thought of that. Isn’t it fabulous that Altenew has grown leaps and bounds in the last 5 years. BTW, I love your card…. especially the sentiment! Love this card! So bright and cherry! How lovely!! Perfect Spring colors . This is gorgeous!! I LOVE the fun little garden you created. Sometimes it’s nice to use single layer stamps. Loved how you did the card. Keeway, your card is gorgeous! The design is incredible! I love the wild flower garden with the sentiment, just gorgeous. Keeway, …I just love what you did with this stamp set…it turned out looking like a field of spring time flowers….so soft and pretty…looks like you could go out and run through it….I love it. Great job! And Congratulations to Altenew indeed! The wild flowers are beautiful and using the foam tape really makes them ‘pop’! Happy Anniversary Altenew! Love the card! Beautiful Springtime card! Love the colors and this beautiful garden scene. I agree Altenew has such gorgeous florals, hence I have way more flower stamps than I ever thought I would have! I love the soft colors and your background splatters!! Happy Birthday Altenew! 5 years! WOW! Amazing. THANK YOU for all your inspirations!! Great card! I am really enjoying this blog hop and all of the beautiful cards! Beautiful card. It’s perfect for spring. Your marvelous use of color just quietly whispers “spring”. It is such a lovely card. Thanks for the inspiration. I always have wildflowers in my garden…these remind me of cosmos! So , so pretty! Happy 5th Birthday to Altenew, your card is lovely! Just stunning, I’m so inspired. Thank you so much for sharing! Fantastic card to showcase a fantastic company, Altenew. Thank you for sharing your talents with us. I love, love, love that card – simply beautiful! I love this darling little garden! It makes me smile! Love this card, so cute. Congrats Altenew. Gorgeous card! This is my 1st Altenew blog hop, and I’m loving all the new blogs I am finding. Your work is beautiful. Your card is soooo pretty and such a great showcasing for Altenew. What a pretty card. Love the sentiment too. Thanks, and happy birthday to Altenew. Beautiful soft coloring and nice shading. Love the card! A beautiful card to remind us that spring is here… Happy 5th Anniversary Altenew! great hop. lots of fun ideas. thanks as always for sharing. Beautiful card with the lovely Wildflower stamp set! I always look forward to seeing what you have put together and inspired us with. Beautiful! So beautiful and just like Spring flowers burst into bloom. Super palette of colors. You nailed that card and such great inspiration. This card is beautiful! One of my favorite sayings! I like that you can add dimension to a stamp by simply using a dauber or sponge when doing a quick card. TFS! So pretty!! Fun blog hop! Reminds me of spring. Thank you for sharing. A beautiful spring garden to celebrate spring. Absolutely gorgeous card. Love the colors. I love the bright happy colors on your beautiful card. This card, like all of your others is absolutely perfect! This card, like all of your others, is absolutely perfect! Beautiful garden card! I love the colors, and the splatter adds just the right finishing touch. Thanks for sharing! So bright and the blending is wonderful! Such a pretty card. Love the soft colors you used for the flowers. Such a beautiful card and thank you for sharing. Such a pretty card! Love the layering of the flowers. Everything about it is gorgeous! This is a lovely and cheerful card! Oh My your card is stunning. I love how you added demention to your flowers. I like how you did the background as well simple but elegant. My kind of card. What a lovely spring garden card! Love the 3-dimensional flowers! Lovely flower scene. So pretty! Nice to see such good use made of one of the sets I do not yet own. Note the word yet! Lovely card. I like Altenew stamps. I recently got the Wildflower Garden stamp set and can’t wait to start using it. Thanks for some great inspiration with your card! Such a pretty card! !Love the soft colors. Very pretty card! I love the Spring colors! Such a fun card, I am so ready for Spring! Thanks for the inspiration! One of the prettiest cards on the HOP!! It must have taken sooo much time to make such dimension with those flowers! Thanks for the inspiration! Such beautiful work!! Enjoying hopping along on this Altenew blog hop – great reason to celebrate! Such a pretty card! Congrats & Happy anniversary Altenew! super pretty! beautiful sentiment too! Oh my! This is such a beautiful Spring scene. I love the watercolored background and all the soft pastels you used. Very pretty, sweet and delicate. I’m not usually a fan of pastels, but this is so very pretty! I love your cards. They are just beautiful! This is lovely! I don’t remember this set, but you’ve done a fantastic job showcasing it. I like the fact that you added the foam tape for dimension. Your card is so dainty and the use of pastel colors make it stand out. Wow what a lovely idea. Thanks for the inspiration and stay blessed. Such a sweet springtime card! Your card looks like a beautiful garden. This stamp set has been on my list for quite awhile (my list always far outweighs my wallet! ), but you have just moved it way up! Love the sweet pastels you used! Amazing card! Love the spring feeling! Very pretty card, Keeway. This is one of my favorite Altenew floral sets also. Your card is totally divine! Beautiful card! Happy 5th birthday Altenew! Oh this is so soft and lovely! Gorgeous card! Love your card! So cheerful! I’ll have to get this stamp set! A very nice sentiment on a card that also says “spring” to me. Thank you for the chance to win and the inspiration! Beautiful card!I love the background shading and popped up flowers! Keeway, your card just denotes spring in such a wonderful way. So pretty! No wonder you like playing with that stamp set. TFS & Happy 5th Birthday Altenew! Wow! Such a pretty card! And that sentiment is wonderful. Beautiful job! Beautiful spring card…love how the die cuts make the flowers the focal points. Wildflowers are a sign of spring and you certainly have captured the feeling of spring in this lovely card. I love the soothing and peaceful colors on your card ! so beautiful ! I really like how the flowers pop up from the background. It is a beautiful card. Such a pretty card! Great use of color and design! Gorgeous card! Happy Birthday Altenew. I love supporting a US company with my craft dollars! Spring has sprung on your card! So cheerful, thank you! Beautiful card! Thanks for being a part of the Altenew blog hop. Altenew has the BEST floral sets! Beautiful card!! So soft and sweet. Your card is gorgeous! I keep saying I’m going to get the Wildflower Garden set and now it is time! Thank you for sharing! Happy Anniversary to Altenew! Happy birthday to Altenew! Your lovely card is perfect for springtime. It makes me want to go outside to smell some flowers. I studied this card for a long time. I love the coloring and the splatters and your methods of shading and adding depth. Beautiful, beautiful card. Love the pretty florals on your card. I am digging the pastel shades you used. Pastels are always a great choice. Great Altenew stamp choice. What a pretty card. 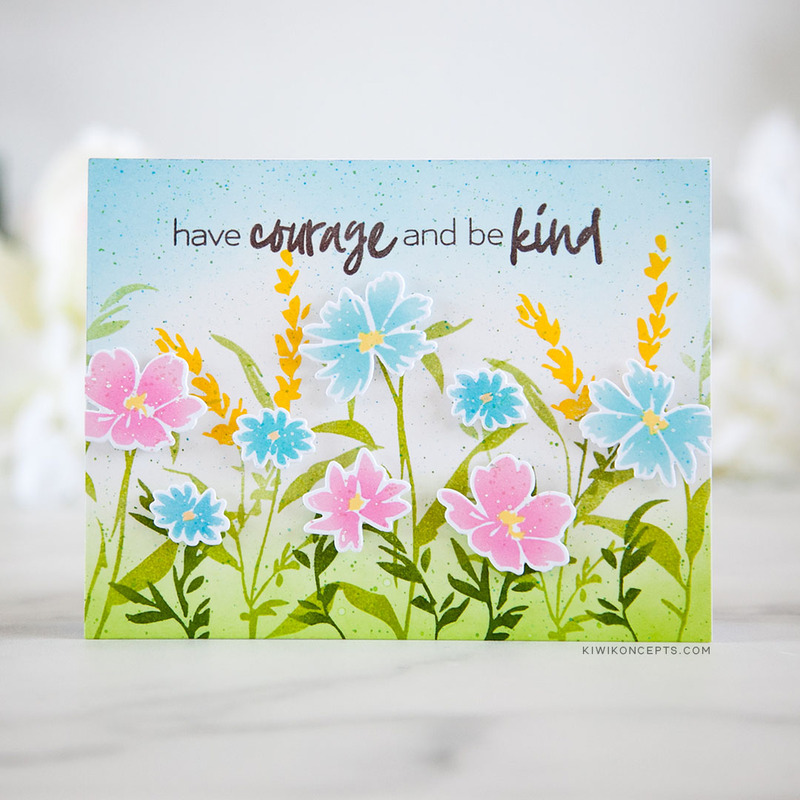 I love wildflowers and the coloring and design of this card is perfect. Such a subtle, delicate, pretty look on this card; love it! Very pretty card! Thank you for sharing! Lovely card and Happy Anniversary Altenew! Well done Altenew! And congratulations! I really love your wonderful projects – especially your pretty flowers. Thanks for the card inspiration! What a beautiful card and colors! What a wonderful card! You made me feel like I was sitting in a meadow of flowers on a beautiful, warm spring day! Your gorgous card looks like a spring field of flowers, awesome! Thank you Keeway for your inspiration and participating in this great Altenew 5th Anniversary party. Beautiful card! Perfect for many occasions! My favorite part of hops like this is getting to see the designer’s favorite products. There’s something so fun about seeing a card that has no restrictions (other than company), so you get to do whatever makes you happy. And what a lovely card you came up with. Thanks so much for sharing! Such a pretty card! Perfect for spring! I like the soft colors! amazing card. I feel spring !!! If you were going for a Spring Look, you did it. Thanks for sharing. I love this Wildflower Garden stamp set! What a beautiful spring card! I love your card. The colors make me so happy. Altenew’s florals are definitely the best out there! Your card has let this set shine – it seems as if those flowers are just waiting to be picked from a field! Love the colors, the dimension, the sentiment, the whole composition. It’s a wonderful card! Thanks for the inspiration. Happy Birthday, Altenew! Wow! Your card is so pretty and makes me want to get the wildflowers stamp set! I’m falling in love with these floral stamps and all the diffrent ways they are used! WOW…I really LOVE your card, Keeway! 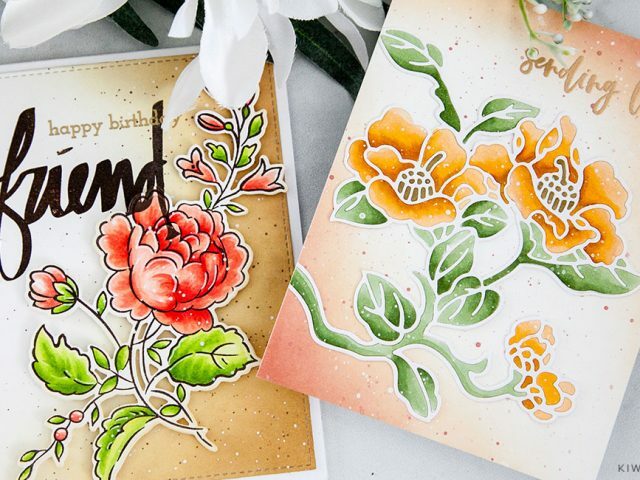 That Wildflower Stamp Set is one of my favorites and I adore what you did with it….just beautiful! I love your sweet garden! Great card!! I would enjoy playing in your wildflower garden. Soft, beautiful and soothing. Love the floral design on this card. Congrats to Altenew, and congrats to the design team on so many beautiful projects! This sample is so gorgeous. Happy celebrations! Love your card! Such pretty colors! So nice to see the beautiful spring flowers and colors. Lovely! Hi Keeway. Your card is very beautiful. Thank you for sharing it with us. I love the popped up flowers! 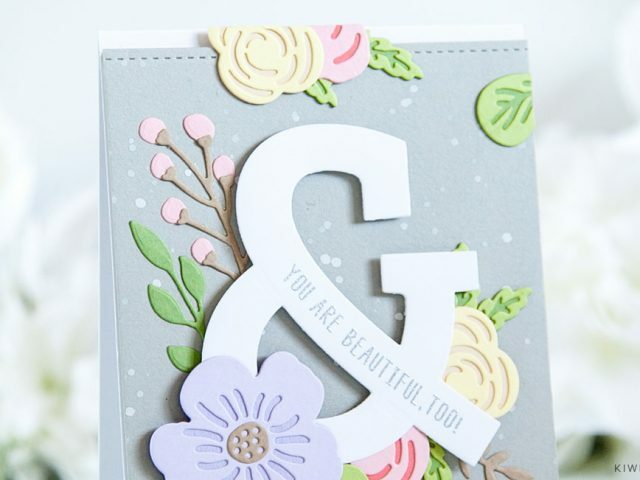 love the pretty soft colors you used for your lovely garden card! What a lovely spring card, Keeway. I love it! Oh, I have to dig my Wildflower Garden set out and play. You have inspired me with this beautiful card, Keeway! Love the fun colors and your amazing ink blending. 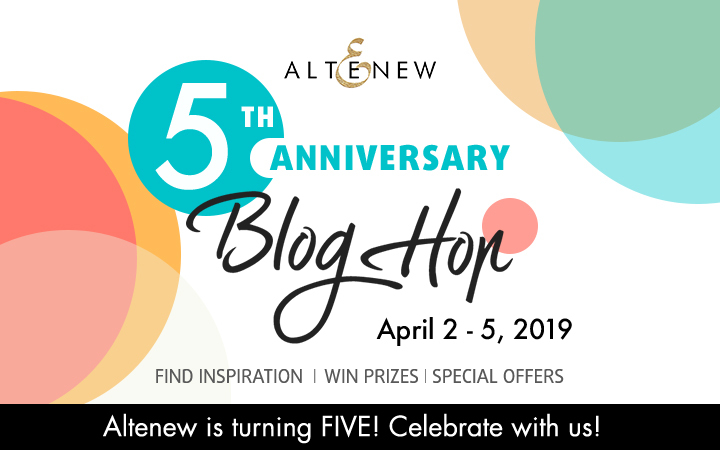 Happy 5th Anniversary, and thank you for always sharing your amazing talents with us in Altenew’s blog hops! Love the splatter. Really made it cool and different. I love the soft colors on your card! Your background is gorgeous! Wildflower Garden is one of my favorite stamp sets. Great card. Beautiful card! It is the perfect picture of spring! Since most of my stamps are old, daubing shading is a great idea. Beautiful card! Love your wonderful coloring and amazing style. So pretty! Love the soft colors and beautiful flowers! Your card makes me feel like I am in the middle of a wildflower garden…well done! Happy 5th Anniversary Altenew! Beautiful card and sentiment. I love how you incorporated the dimension. Looks like you’re standing right next to a field of wildflowers. Hi Keeway … nice to meet you. 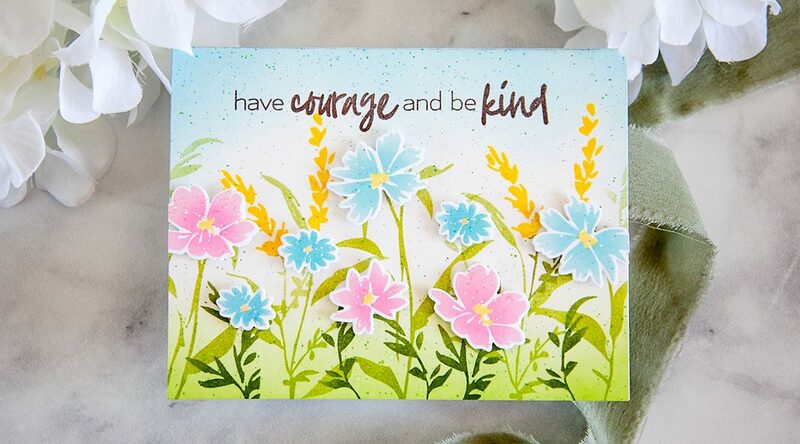 I love your card “Have courage and be kind”. Very timely message for these days. We need more kindness among us. Thanks for participating in the Altenew 5th Anniversary Hop. What a beautiful card!! This is one of my favorite Altenew sets too. Oooh, this is so pretty! I love how you used both colour and foam squares to create different levels of depth. So clever! Lovely card! Happy5th Anniversary Altenew! Gorgeous card! So happy and encouraging! so pretty! they have the greatest sentiments too! Love the card! Love the stamp set! Have to have it. Congratulations to Altenew! Such a gorgeous field of flowers! Such a sweet card! Very uplifting! What a lovely springtime card! I just love it! Yes I do love the springy look of this card, just beautiful! This is my favorite card in the hop so far! Happy Anniversary Altenew! Such a beautiful card with an even more beautiful message! such a pretty card! Love these stamps and the soft colors! I love the soft pastel colors and that fabulous stamp set!! Happy 5th Anniversary Altenew!! I agree with this sentiment! Thank you! I love the spring colors! I love the way you did the background. I love the colors of this card. It is amazing. The sentiment on this card is so beautiful. I love the way this card turned out. I love the background of this card. It is beautiful! Wow your cards are beautiful! I love the color combinations you chose. Such a beautiful card. Beautiful card design! This is one of my favorite stamp sets too! I love how you die cut the flowers and popped them up for dimension. I don’t have the die set but I’m thinking now that I need it! Beautiful!! It perfectly captures spring!! Such a cheerful, springtime feel to this card! Very nice. Such pretty spring colors! I love the sentiment. Thanks for the inspiration. I love your sweet card! This is just gorgeous! Who wouldn’t love to get this in the mail? Ah…….. Such a soft pretty card. I really like it a lot. Beautiful Spring card. So Cheery! Thank You for sharing. What a friendly, beautiful card in great colours ! I really like it a lot ! 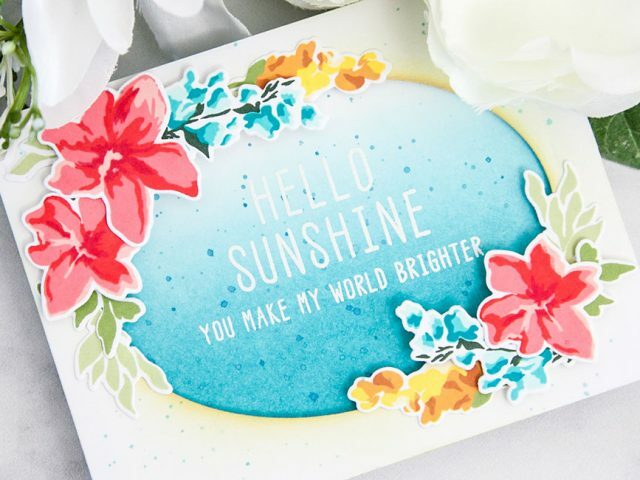 Beautiful card – it all looks like a bright sunny, summer day. Wow! Your card is such a happy field of spring wildflowers! I just totally says spring! Thanks for the great inspiration! Beautiful card!!! It screams Spring!!! I love this springy card! The color choices abd placement creates depth to the card. I love the fine sprinkles too. Happy Birthday Altenew and many more! Sweet garden card! Love your design approach with Altenew products especially your use of color as a design element! Thank you for sharing your PASSION for creativity! Adorable card! Love the spring colors! So beautiful card! Thanks so much. 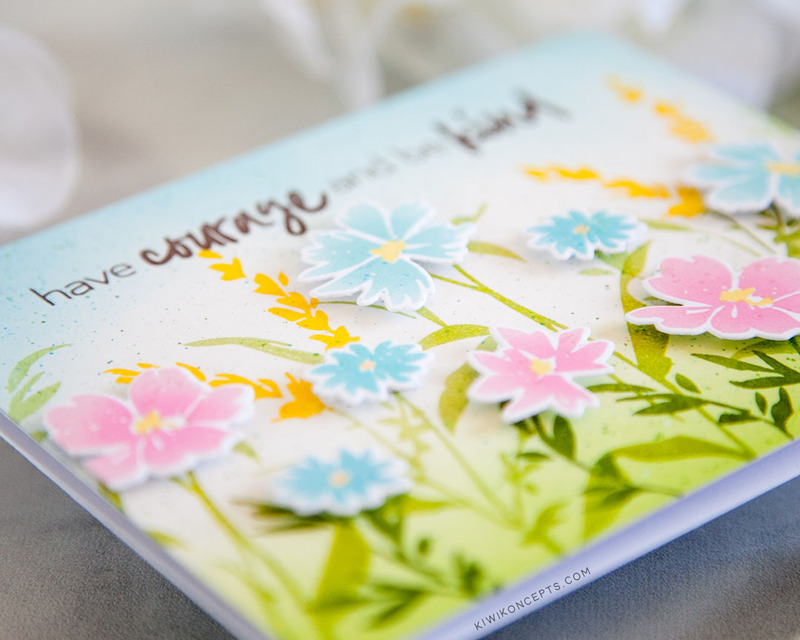 Nice idea to pop up the flowers – adds so much interest to this charming spring card and it beautifully showcases Altenew’s whimsical Wildflower Garden stamp set. Thank you. So pretty! Happy Birthday Altenew! I love your gorgeous floral card! So pretty! Great for Spring. Beautiful card and beautiful colors. Your wildflower card just shouts “Spring!” I love the colors you used. Thanks for the inspiration! Such a pretty card – thanks for sharing! Very beautiful card. I love the sentiments. Lovely spring card. Thanks for sharing. What a delightful card. Love the softness of the colors. I really like the shading of the sky and grass as background. Another beautiful card. It’s so sweet. How pretty!! Love the popped up flowers! So sweet and pretty! The flowers look so delicate. They are perfect for the great sentiment. I have been a fan of Altenew right from their first release. Their designs just seem to get better and better every time. Hope they keep growing and delighting us with fabulous new products. This is definitely one of my most favourite cards by you! What ink did you use to splatter? Awww.. Gorgeous..Love the soft colors..
Super sweet card, love the sentiment font and the popped up flowers! Better Together is my fave stamp set & I love it with the wildflowers. Gorgeous! That is a cute stamp set. I like the way you did most of the stamping directly on the card, then popped up the main flowers. The card is so springlike which is needed as I’m currently watching a snowstorm taking place. Love the encouragement sentiment. Definitely a must have! LOVE your CHEERY background and POP of PRETTY flowers! Your card looks like a beautiful Spring garden. Just lovely! Happy Birthday, Altenew! Such a beautiful card! I do love the Springy look! This stamp set will now be added to my growing list of Altenew stamps! Thank you for the inspiration! Happy Anniversary Altenew! Love this beautiful “field” of flowers. They are colored so wonderfully. Beautiful, springlike card! I love it! What a perfect card for spring. Love your work. Love your springy card and how you used the inkpad to color the elements. Thank you.